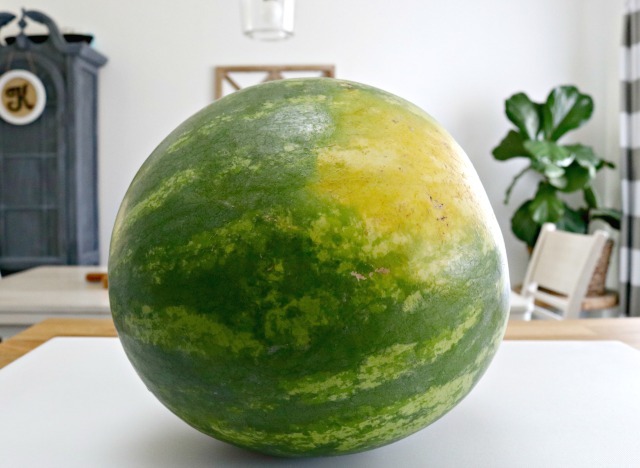 Watermelon is a summer staple in our home. 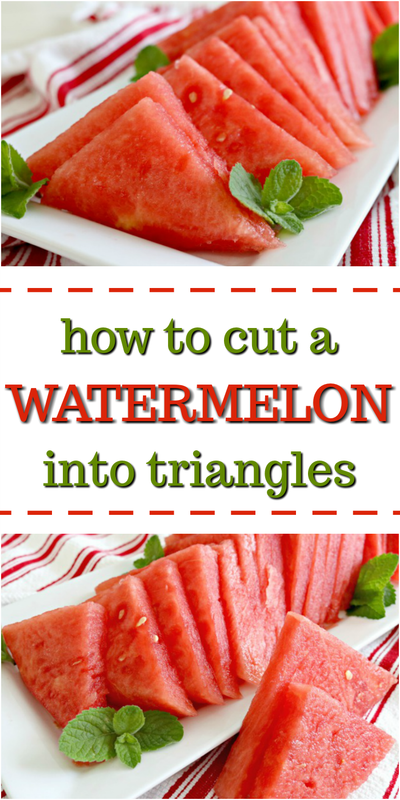 A few years ago, I learned How to Cut a Watermelon into Triangles, and it was such a game changer! 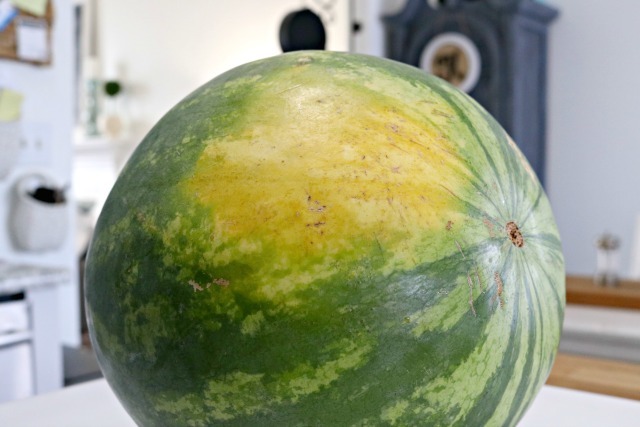 We now have watermelon at the ready for snacking and to pair with meals at the ready at all times! 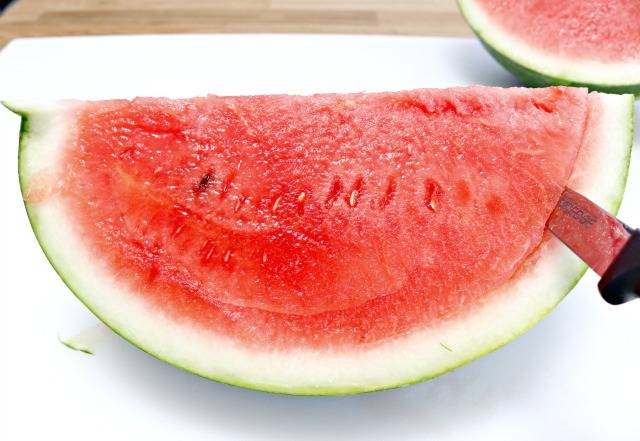 In the summer, there is nothing better than a cold slice of watermelon. It’s so juicy and our whole family loves it. 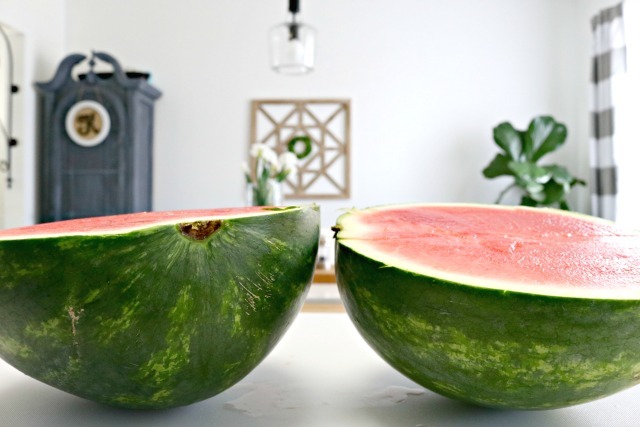 I remember years ago, I would hesitate to buy a whole watermelon because I didn’t really know how to cut it the right way, so I would just try to find it pre-cut or would skip it all together. One summer, we were at a cook-out at my friend, Jenni’s, and she showed me how to cut a watermelon into perfect triangles. It was mind blowing to me that not only did she cut it into the perfect triangles, but it also only took her a couple of minutes to cut the entire thing into perfect triangle slices. 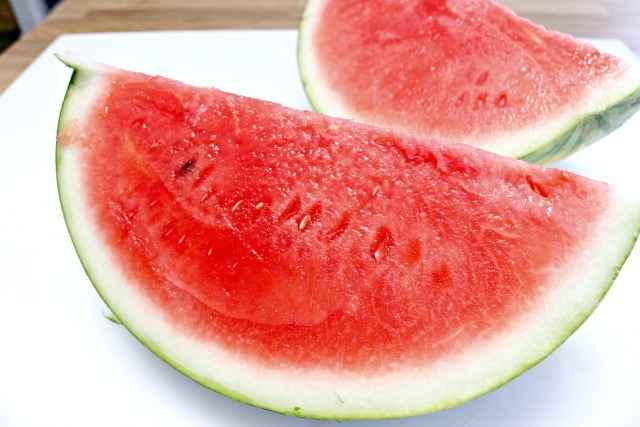 Since then, if watermelon is in season, I always have a large bowl of it sliced up in our refrigerator. 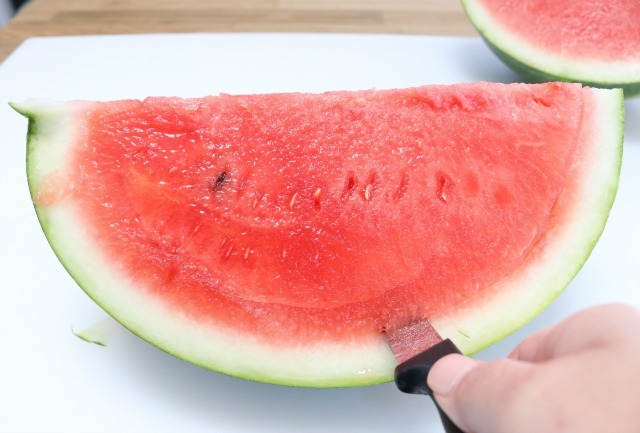 I hope that this step-by-step tutorial will help you learn how to cut a watermelon with ease so you can enjoy it all summer long too! First, you need to wash the watermelon’s rind. 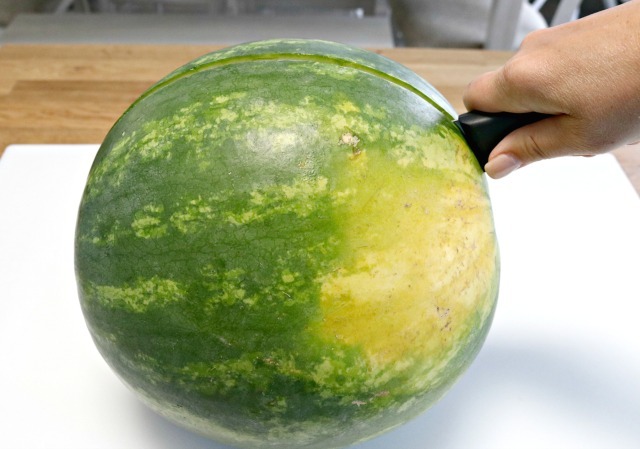 When you cut into it, you definitely don’t want to pull any dirt or germs through the inside of the melon with your knife. 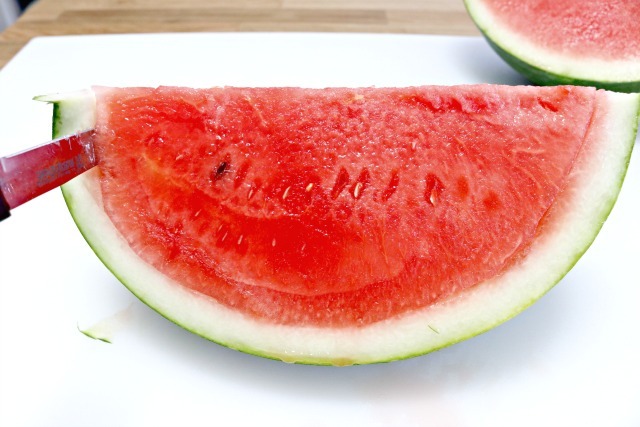 A little tip on how to choose a nice, ripe watermelon…look for a large yellow spot. This shows you that the watermelon has had time to ripen off of the vine. Time to cut it! I like to use a large cutting board so the juices have somewhere to go. 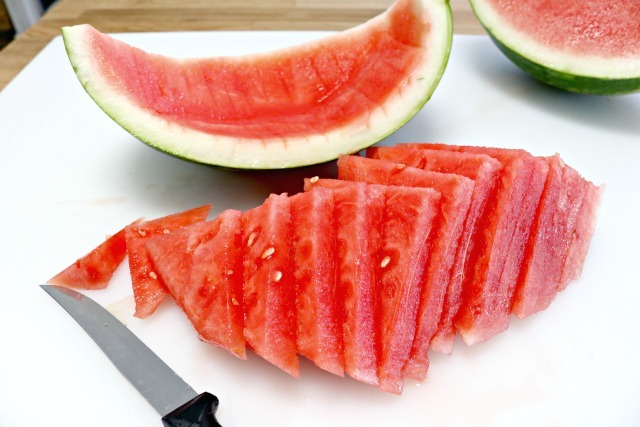 Start by cutting the watermelon in half, lengthwise (top to bottom). You should have two halves now. Place each of those halves face down on your cutting board or surface. Cut the halved watermelon from top to bottom again. At this point, you should have 4 quarters. 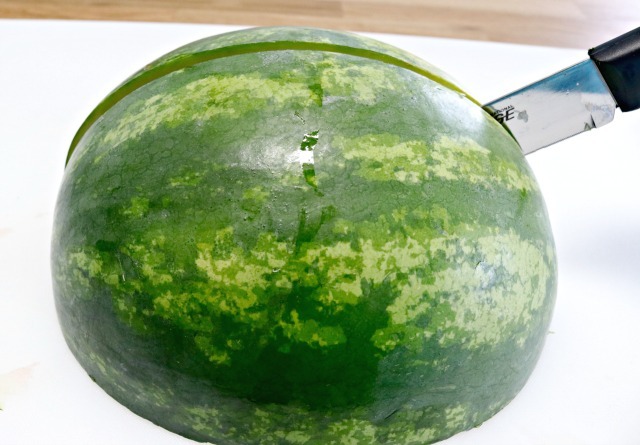 Now it’s time to cut the watermelon out of the rind and slice it. You will take each quarter and start by running a knife from right to left. Poke your knife as far through as it will go and start running it along the line of the rind. See photos below. 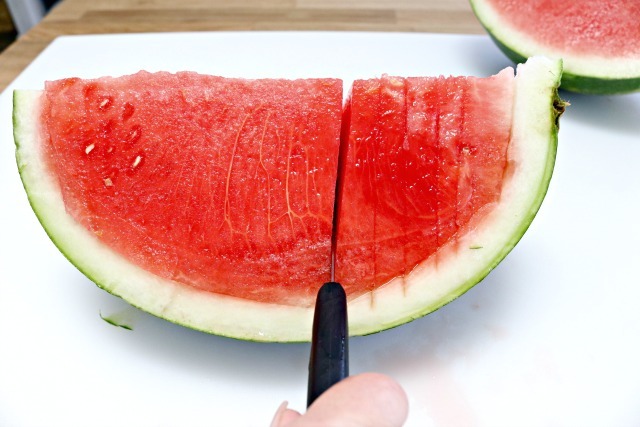 Once you have gotten to the end, flip your quartered watermelon around and repeat the process on the other side. At this point, your watermelon will be detached from the rind, but still sitting inside of it…this helps with the slicing. Now slide your knife up and down from one side to the other. 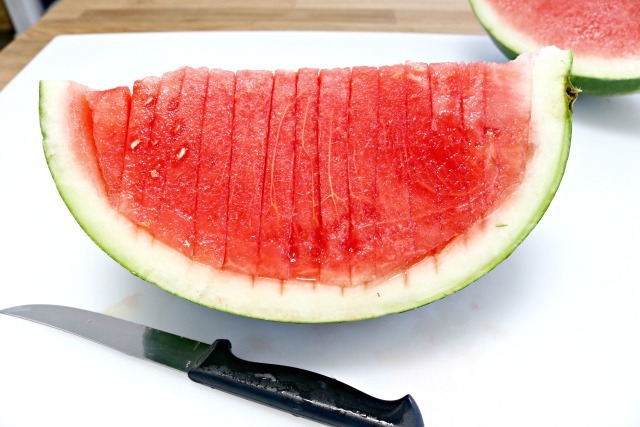 See how the watermelon is sliced inside of the rind? Now you can dump it onto a plate or into a bowl. 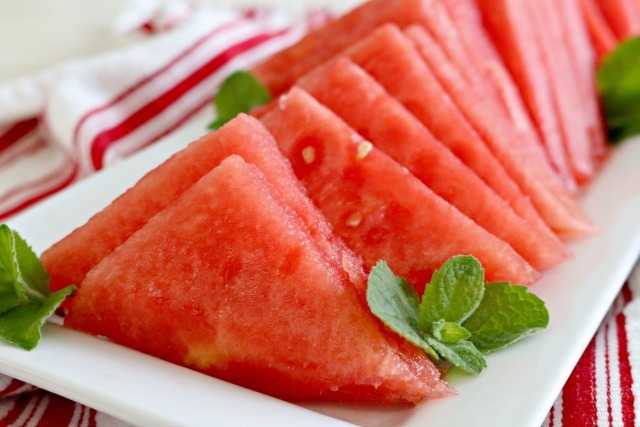 The end result is perfectly sliced watermelon ready to serve to your family and friends! I like to store mine in the refrigerator for a couple of hours before eating. For some reason, it just seems to sweeten up once it gets cold. 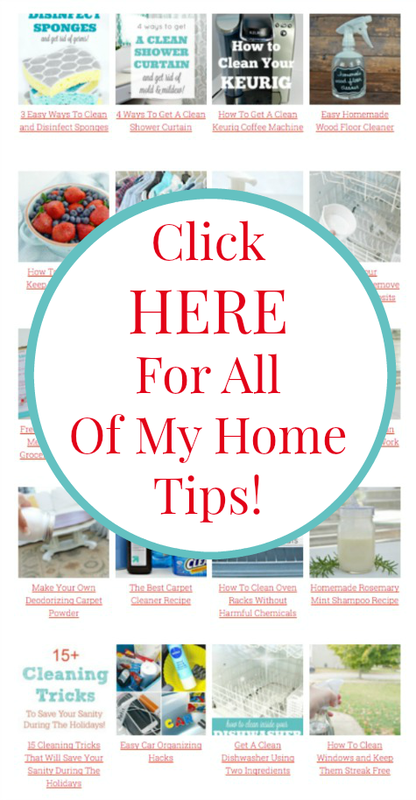 You can find this tip and hundreds more like How to Clean and Keep Berries Fresh Longer and How to Cut a Pineapple HERE on my Home Tips Page! Wow! This is so simple!! Thank you!!! I will definitely try this the time I have watermelon. Funny, I always have cut up cantaloupe this way, but never considered it for watermelon! Duh! What kind of knife do you use? I have one of those watermelon colored knives from Walmart that has teeth like a bread knife and I butcher mine every time. Hi, Donna! I use a large butcher type knife to cut it into halves and quarters and another smaller straight edged knife to cut it out of the rind and into triangles. The knife you are using is a serrated knife and is better used on breads. Hope this helps! Just in time for the 4th of July. Thank you. I will be using this tip. Once mom went to a PTA dinner and dad let us eat watermelon. I ate so much I can’t eat it anymore. But my son likes it. So for him I will do what you did. I will just wear sun glasses. Thank you Jessica! I love watermelon. And now I’ll probably eat more of it! It makes it so much easier! Enjoy!